This document describes the attachment and revision features of the KB document editor. It also includes a training exercise in which document authors attach and insert an image file into a document. For detailed information about other aspects of the document editor, please continue with this training series or return to the KB Author Training - Overview. In previous sections of this training series we covered the Insert Image (WYSIWYG editor) and Img (HTML editor) features. Those buttons allow you to embed an image that is hosted elsewhere on the internet into your document. Please refer to KB User's Guide - Documents Tab - Insert an Image from another Website for a refresher. However, a better method of placing images or other files into your documents is to upload them onto the KB server and place them directly into your document. You can use the document editor's Attachment feature to accomplish this. Click the link labeled Create doc [your doc number] attachment folder underneath the Body field. Note that you must have saved your document at least once in order for this link to appear. 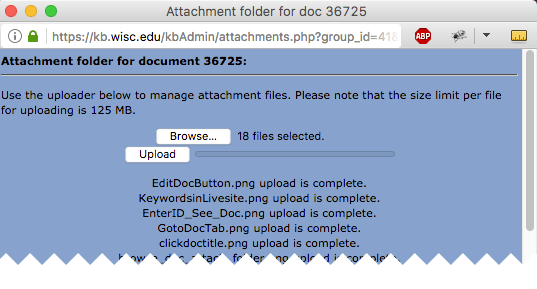 You will receive a prompt asking you whether you want to create an attachment folder. Click OK to proceed. The image below shows that doc attachment folder for document 36725 has not yet been created. The image below shows that the document attachment folder for doc 36725 has been created and there is one image in that folder. The image below shows the Attachment folder uploading window for document 36725. Note: Individual images and attachments must be smaller than 125MB. Multiple 125MB images can be attached to a single document, but each individual attachment must be smaller than 125MB. To select the specific images/files to upload, click the Browse button. The multi-selection allows you to choose 500 files or more. The number of files you selected will appear in the Attachment folder uploading window, next to the Browse button. Next, click on the Upload button in the Attachment folder uploading window. A progress bar will appear and, very soon after, a list of the images/ files you uploaded will appear next under the Upload button. This feature is especially beneficial for those using a large number of individual files stored in multiple folder levels. The uploader in Firefox, Chrome and Safari uploads more files at once as well as larger files. Unfortunately, the current KB uploader does not work in IE nor Edge, so neither will not have a multi-select feature and is still limited to 125MB files. The image below shows that 18 files were selected via the browse button and that they were all successfully uploaded. Click Close button to leave the Attachment folder uploading window. When you return to the document Editor screen you should see a list of uploaded files and their attributes next to the Attachment link. The image below shows the Attachment section of the Edit screen now filled with a variety of attachment types. To add one of these attachments to your document, simply click on the Quick link or Plain link. To insert an image you have uploaded into your document, place your cursor at the desired point in your document. Then click Quick, Adv. or Plain link as appropriate. Your KB site may have resources such as images, banners and logos stored in a Shared attachment folder. Unlike a document-specific attachment folder, the shared attachment folder is easily accessible to all documents. The shared attachment folder functions just like a document attachment folder. Documents tab > Shared Attachments link > Shared attachment folder for your group space pop up window. Attachment section of the Document editor > Open shared attachment folder link > pop-up window titled Shared attachment folder for your group space. This window shows a list of files and images. You may select, delete, move, rename and delete images. 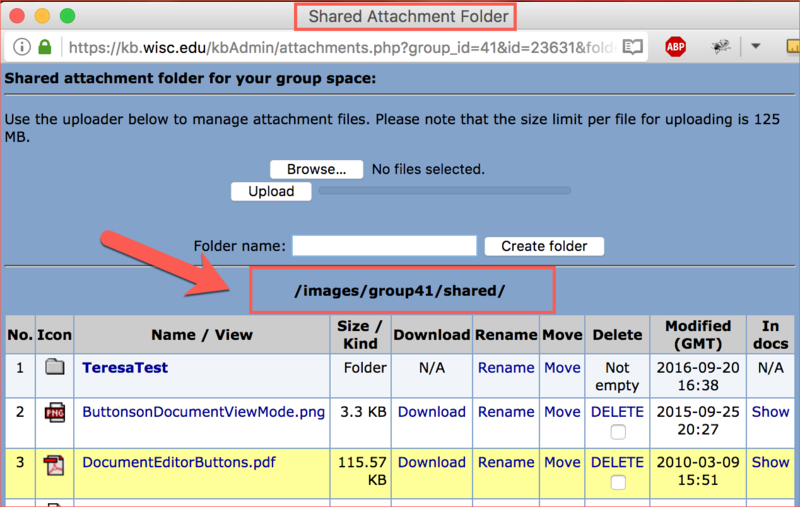 The image below shows the Shared Attachment Folder pop up window for the KB User's Guide which has a group number of 41. The arrow below points to the file path of the KB User's Guide file path. If you wish to upload a new image to the Shared attachment folder, click the the Open shared attachment folder link. If you wish to place an image or file from the Shared attachment folder into your document, click the Show shared attachments link. One of the KB's most powerful features is the document Revision History. Each time you click Save change button on a document, a copy of your document as it exists at that point is stored in the KB's database as a discrete version. Even if you make and save changes subsequently, each previously saved version of the document is still present in the Revision History. This is useful not only because you can view previous versions of your document but also because it is possible to restore previous versions of a document. In the document editor, click the See revisions link located to underneath the Body field and to the right of the Save change button. Version is a number assigned to a set of changes based on the order in which they were saved. The higher the number, the more recent the revision. Document Title is the title of the document as it existed during the version in question. Last Updated By is the document author who made the changes saved in the version. Last Saved At is the date and time changes were saved in the version. Age is how old the version is relative to today's date. The Compare checkbox allows you to select the versions you wish to compare. Click on the Document Title of the version you wish to view. Select one or more Compare checkboxes, and click Compare Selected to display multiple versions at once. You will be taken to your selected version(s). At the bottom of each version you will see a button labeled Restore with this version. Only click this button if you wish to have that version of the document available to you in the document editor for publishing. If you just want to leave the version without restoring it, you can click the buttons for Return to revision list or Return to document editor. Click the Compare w/ active version link. A window displaying your draft document and the corresponding active document will open. Below the documents themselves, a table displays the changes to the underlying HTML. You can close out of the comparison window and return to the document editor at any time. Save the below image to your hard drive by right-clicking it (if you only have one mouse button, you can CTRL+Click) and selecting Save Target As... or Save File As... (exact wording depends on your web browser). Remember where on your hard drive you saved the image. If you are not already logged in, log into the KB Admin tools. Locate the document you edited in the previous exercises and open it for editing. If you are unsure how to locate the document, return to KB Author Training - Editing an Existing Document and review the instructions there. 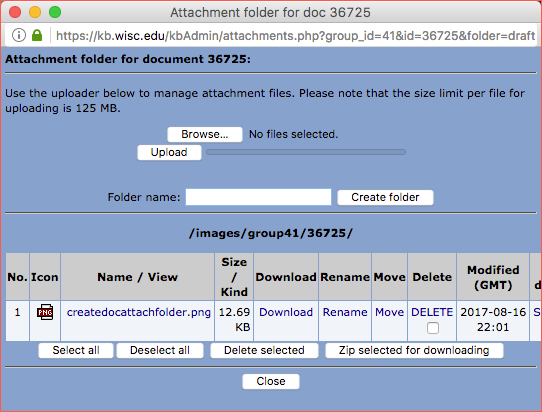 Click the link labeled Create doc [your doc number] attachment folder. Use the Browse button to to find and select the image you saved to your hard drive. 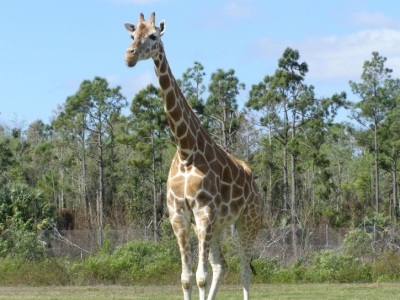 Once you have selected the image, click the Upload to upload onto the KB server. Click your mouse cursor in a location in your document. Then click Quick to insert the image into your doc.